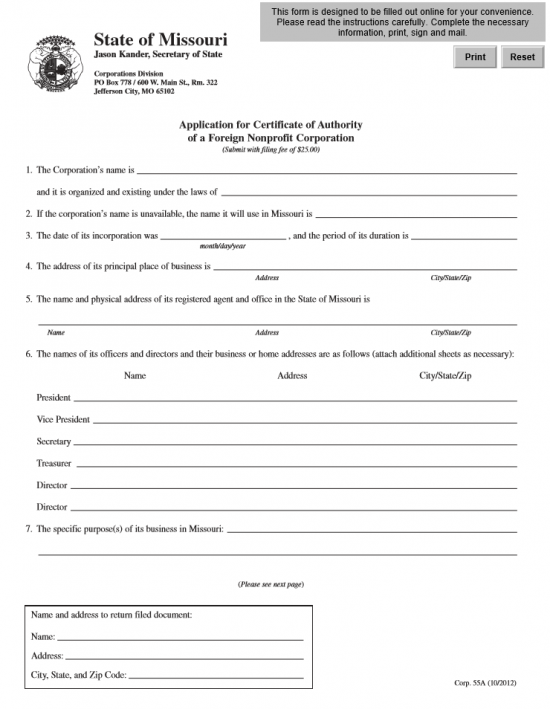 The Missouri Nonprofit Corporation Application For Certificate of Authority To Do Business in Missouri | Form 55A shall outline the broadest requirements the Missouri Secretary of State must receive from a filing entity before allowing it to operate as a nonprofit corporation. This application will need to be accompanied with a Certificate of Existence issued by the Secretary of State (and within 60 days of the application date) where the foreign entity resides. 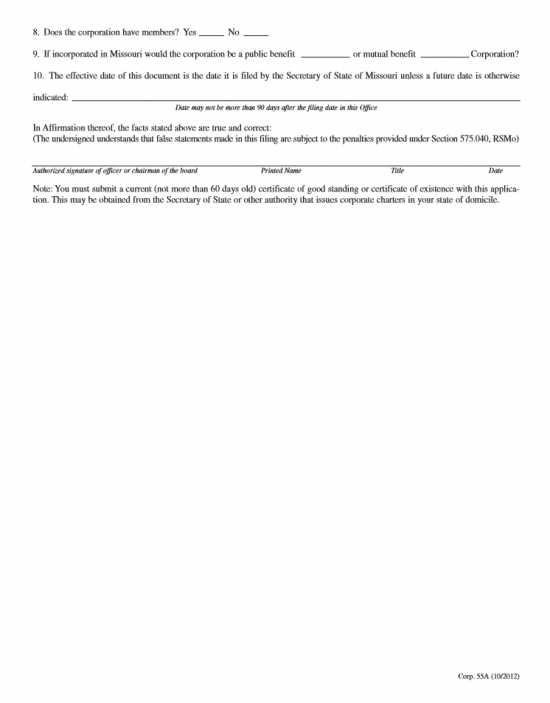 This application must also be accompanied with a full payment of the $25.00 Filing Fee. This may be done by check if filing by mail (Secretary of State, Corporations Division P.O. Box 778/600 W. Main Street, Rm 322, Jefferson City, MO 65102) made payable to Director of Revenue. The Filing Fee may be paid by credit card only when filing online (https://bsd.sos.mo.gov/LoginWelcome.aspx?lobID=1&ReturnURL=~/BusinessEntity/NewBEFiling.aspx?beID=3175573%26FilingTypeID%3d1844). Step 2 - In Item 1, enter the Full Name of the filing entity as it appears on its Certificate of Good Standing on the first blank line. Then on the second blank line, enter state where this entity is incorporated. Step 3 - Item 2 requires attention only if the foreign corporation may not use its Name in the State of Missouri. If this is the case, report the Name the filing entity will operate under. Step 4 - In Item 3, report the Date of Incorporation for this entity on the first blank line. On the second blank line, either enter the number of years this corporation shall operate for or the word “Perpetual” (if it intends to operate indefinitely). Step 5 - In Item 4, enter the Full Address of the filing entity’s Principal Place of Business or Principal Office. 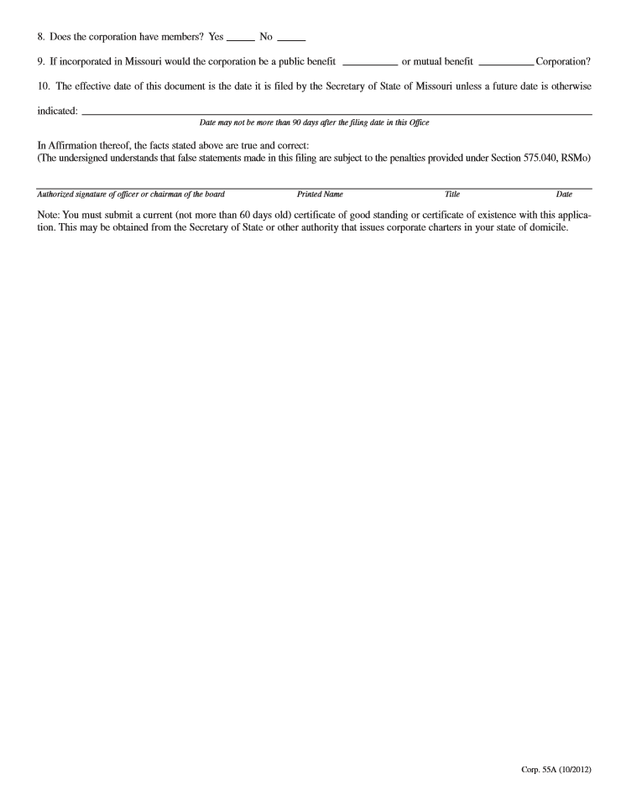 Step 6 - In Item 5, enter the Full Name of the Registered Agent who has agreed to receive service of process on behalf of the filing entity above the word “Name” on the blank line provided. Then, on the same blank line above the words “Adress” and “City/State/Zip,” enter the Full Address where this Registered Agent is physically located. Step 7 - In Item 6, provide the Full Name and Full Address of each Officer and Director serving this corporation. The address may be either a place of business or residential address. Step 8 - In Item 7, report the specific Purpose the filing entity has for transacting business in the State of Missouri. Step 9 - Next, you must provide contact information for the Missouri Secretary of State in the box containing the lines labeled “Name,” “Address,” “City, State, and Zip Code.” This is where you wish the Certificate of Authority to be sent from the Missouri Secretary of State. Note: If this application needs to be returned for corrections, this is the address that will be used as well. Step 11 - In Item 9, you must specify the type of nonprofit corporation this must be. If this is a public benefit corporation then place an X on the first blank line If this is a mutual benefit corporation, then place an X on the second blank line. Step 12 - In Item 10, you will have the option of separating the Effective Date and Filing Date. You may choose to have the Effective Date to be enacted anytime within 90 days of the Filing Date. Otherwise, you may leave this line blank. Step 13 - Finally, an authorized Officer or Chairman must provide a Signature, Printed Name, Title, and Date of Signature. Step 14 - Make sure you have obtained your Certificate of Good Standing from the filing entity’s parent state. This must be an original with original signatures and seals and must dated within 60 days of the filing date. Attach this document to the Articles.